Photo albums have served first and foremost as aids to oral story telling where the complier was herself present to place context on the images. However, when the photo album is separated from its author, we are left with silent fragments, a book of illustrations without a story. 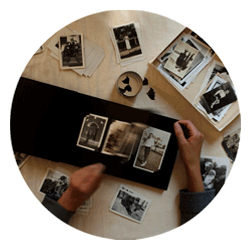 Through her film what are we to make... , artist Tara Ernst attempts to reconstruct the narrative of her fragmented ancestry through a creative reworking of her great-grandmother's family photo album. Part auto biography, part family archive, what are we to make... questions the ways in which the family photo album frames female identities while reflecting upon memory in relationship to vernacular photography. It also places emphasis on the specific experience of women who have traditionally served as the collectors, archivists and story tellers of the family photo album for the past century and whose voices are re-awoken here through the shared experience of mental illness, isolation and motherhood.